French architects Hamonic + Masson have completed an office and residential building in Le Havre, France, with metal bars across the facade. 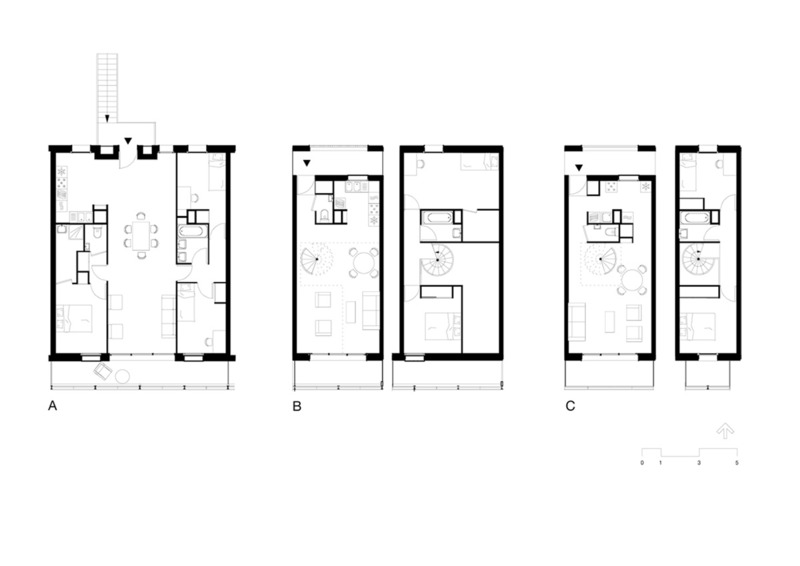 Called Docks Dombasles, the project consists of five volumes with pitched-roofs. 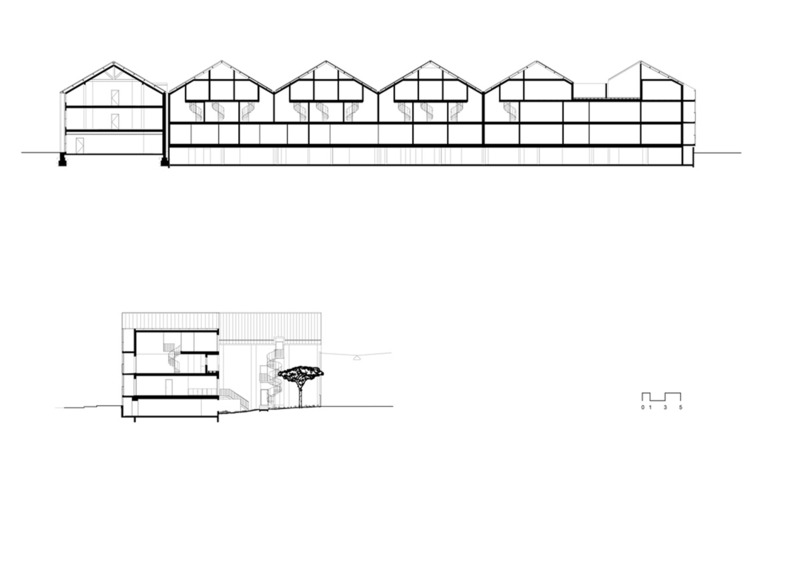 These are arranged side-by-side in line with an existing brick warehouse building of similar shape, which houses the offices. Balconies shaded by brises-soleils are divided by white fabric screens. The ground floor is elevated above street level and wrapped in green glass panels. Photographs are by Hervé Abbadie. 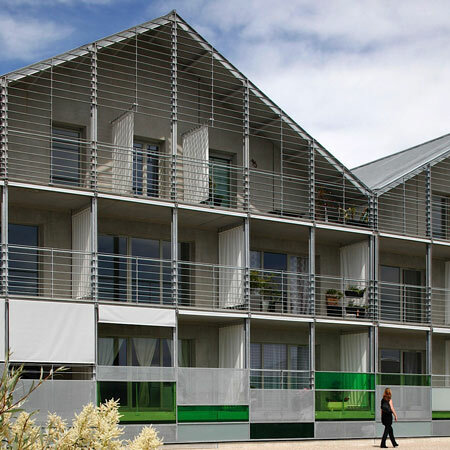 Harmonic et Masson's mixed-use office and housing building is part of an initiative to preserve and reuse the industrial heritage of the southern quarters of Le Havre, France. Through its scale, rhythm shape and materials, the project forms an integral part of a re-envisioned harbour landscape, creating the transition between a domestic scale and the greater harbour landscape. A 19th century brick warehouse, or aveole, was conserved and incorporated into the project to house the office space required in the programme. The warehouse's silhouette and scale subsequently inspired the repetitive module that was used for the housing portion of the project. The use of modules allowed for a prefabricated construction system, both for the concrete structure and the metal facade. The southern, dockside, elevation comprises of a pattern of metal balustrades and sun-shading devices that refer to the character of the site: galvanised metal, grey fabric blinds that help enliven the facade and white fabric privacy schemes. The apartments are all double orientated with living spaces and large balconies facing south towards the water and services facing the north. 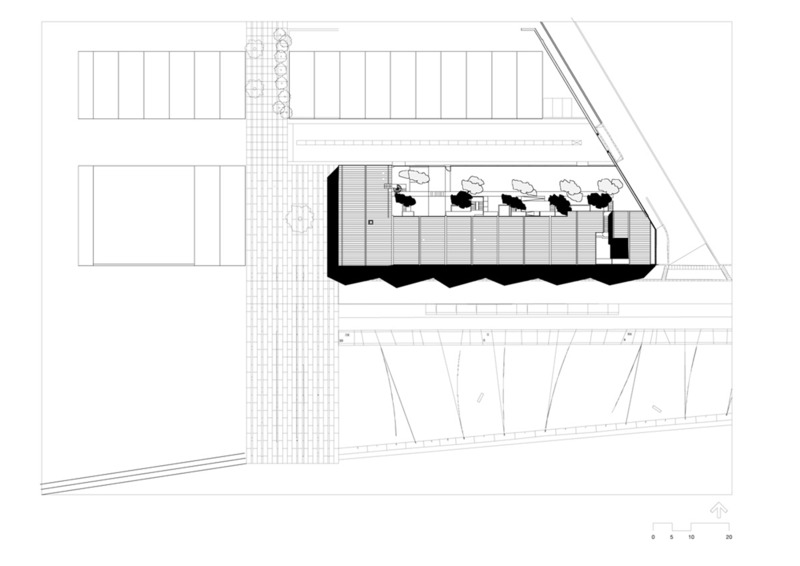 The entire building is lifted a half-floor above the quay to clearly define the limit between public and private space and to liberate the ground space for naturally ventilated parking and garden. This half-floor is enclosed by a pattern of perforated metal sheeting and green glass panels, graphically referring to the vegetation found in the neighbouring park and urban space, designed by Obras architects. 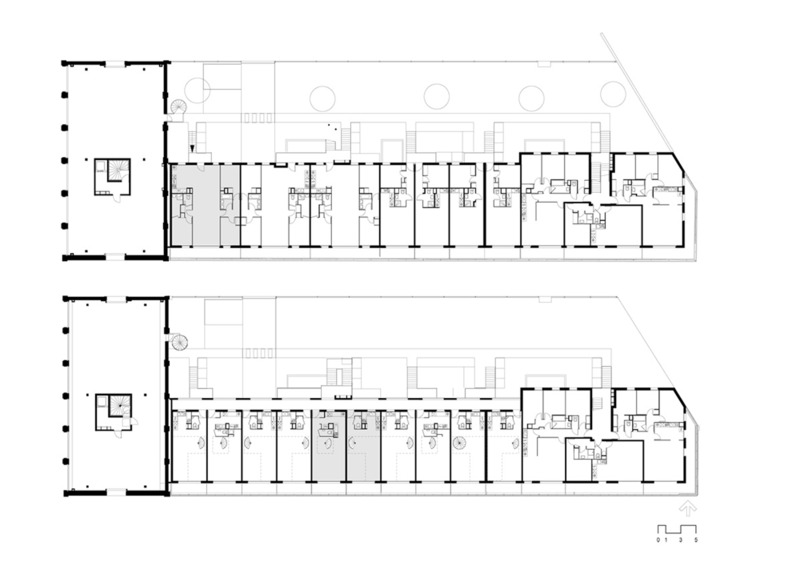 The project includes both private and public housing.